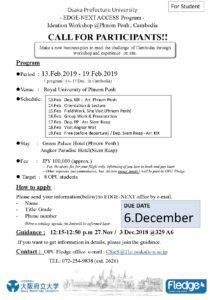 Make a new business plan to meet the challenge of Cambodia through workshop and experience on site. The entry has been closed, thank you. *If English is your native language, it is not necessary. ＊Please input your participated QREC lecture name or program name. We’ll have an interview with either of the fifth week in November. We’ll have an interview with either of the third week in December. The expense (voyage costs, the hotel charges, entrance fee) to depend on a program is supported in full. In addition, you are liable for the final report after participation (going to publish it as a booklet). We are looking forward to seeing you this program! ↓ For more details, please click the images below.